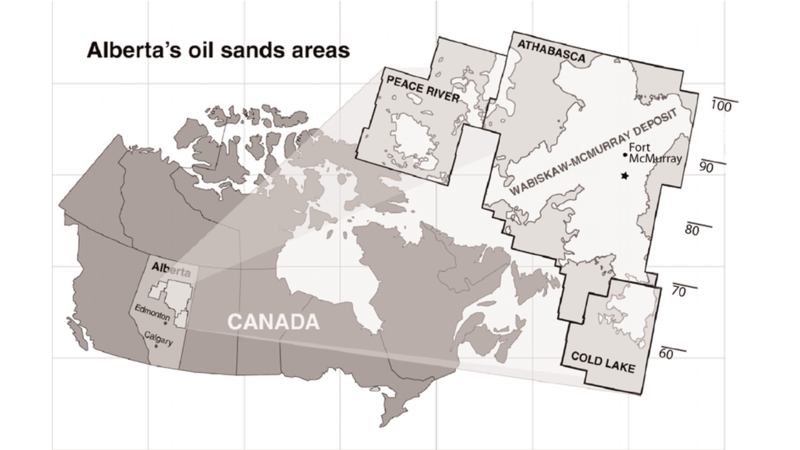 Canada has the world’s third largest oil reserves, mostly located in Alberta region as the oil sands deposits. Alberta oil sands are the only one to make bitumen extraction feasible just using warm water in commercial scale, although oil sands deposits are found all over the world. The oil sands are a loose sand deposit containing a very viscous form of petroleum known as bitumen, coarse sand grains, fine minerals solids, clay and water. In the surface mining operation, the oil sands ore is mixed with warm water (35 – 80 °C) and caustic to produce a slurry. The slurry is then transported to the extraction plant by pipeline, where the bitumen froth is recovered by ﬂotation. The bitumen froth is treated by adding organic solvents to remove remaining water and fine solids, and the final bitumen product is shipped to downstream for upgrading or refining process. While bitumen extraction using warm water is an economic recovery process, its disadvantage is high fresh water and energy consumption. The volumetric water/bitumen ratio in this process is approximately 19. The majority of the process water is recycled, but some of the water is trapped in the wet unsettled tailings, giving net consumption of 2 – 4.5 barrels of fresh water to produce 1 barrel of bitumen. The resulting wet tailings, a mixture of water, fine solids, and residual bitumen, require large tailings ponds, which had accumulated to about 1.18 billion m3 by 2015. These large volumes of wet tailings are a risk to wildlife and a liability for future remediation. Over decades, numbers of technologies have been attempted to solve these issues but the challenges remain. New and emerging technologies to improve current oil sand industry’s performance and to reduce the environmental compact are strongly demanded. In the seminars, I will present an overview of current bitumen extraction from oil sands industry and introduce new research directions undertaken in our research group, which consists of both fundamental understanding of the issues and new technologies development. How to recover bitumen from the oil sands economically and efficiently is the ultimate goal of oil sands industry. One of major technical challenge in water based bitumen extraction is the ore processibility. It was found that the fine solids in ores have a detrimental effect on bitumen recovery, where ores with low fine content give good bitumen recovery (> 90%) while ores with high fine content yield low bitumen recovery (< 70%). In reality, the quality of ores varies from one mine location to another and within the same mine location, which affects the bitumen recovery adversely. It is generally acknowledged that the clay fraction (< 5 µm in size）is the key factor to influence the bitumen recovery, but the mechanism of the fine solids/clay affecting bitumen recovery is unclear. In this talk, I will summarize recent progress in fundamental understanding the interactions of fine solids/clay with bitumen using different techniques, and brief what the clay research gap in oil sands processing is.